Alcatel Idol 5 Found on Geekbench with Android N, Snapdragon 625, 3 GB RAM - Playfuldroid! 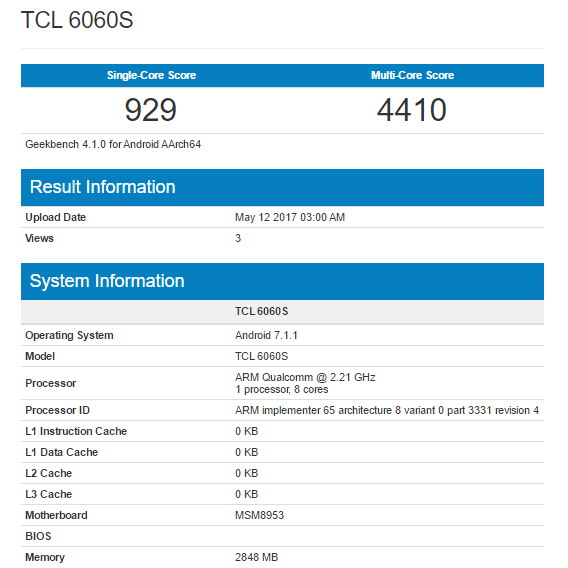 The Alcatel device labelled as TCL 6060S has appeared on Geekbench benchmarking platform. It is the Alcatel Idol 5 that has previously appeared on Geekbench on May 2 and April 28. It seems the company is testing the phone before launching it. The Snapdragon 625 edition of Alcatel Idol 5 has also appeared on GFXBench in the previous month. It revealed that the phone features 5.5-inch FHD screen, 32 GB storage, 12-megapixel rear camera, 8-megapixel front camera, Android 7.1.1 Nougat, Snapdragon 625 and 3 GB of RAM. A MediaTek edition of Alcatel Idol 5 has been also spotted recently on GFXBench and Geekbench. Its specs include 5.5-inch FHD screen, MediaTek 6757CH SoC, Mali-T880 graphics, 2/3 GB RAM, 32 GB storage, 12-megapixel rear camera, 8-megapixel front camera and Android 7.1.1 Nougat. Speculations have it that the Snapdragon edition will be aimed towards the states whereas the MediaTek variant will be coming to Asian markets.